A new innings for Ram Sewak Sharma. Only the ground has changed. From the coveted post of Jharkhand’s Chief Secretary to the vital responsibility of handling important Communications & Technology Ministry in the Union Government. From the land of minerals to the capital of the country, Ram Sewak Sharma’s endeavor has been to change people’s lives through technology. And now he is back in Delhi. Looking at his career, one can easily guess that R S Sharma will leave no stone unturned in spreading the message of e-Governance throughout the length and breadth of the country. The 1978 batch IAS officer has been appointed as the Secretary, Department of Electronics and Information Technology (DeitY), Government of India. Sharma succeeded former IT Secretary J Satyanarayana, who recently retired on 30th April, 2014. As the Secretary of DeitY, Sharma will be performing an instrumental role in taking benefits of IT to the citizens of the country. He has done same in the state of Jharkhand in the capacity of Chief Secretary. As the Chief Secretary of Jharkhand, he played the pivotal role in reaching out services to the last mile with the help of IT and e-Governance. He is the man behind the Aadhar, the single most important initiative by the government to facilitate citizen centric service delivery. Once speaking about Aadhar based services in Jharkhand to eGov, R S Sharma said, ‘the Aadhar coverage in the state is nearly 92 percent which is more or less universal, and wherever there are beneficiaries, we do not deny service on the basis of non-availability of Aadhar. However, what we do is that when we place the service on the basis of Aadhar, we advice them, in person, to get enrolled so that they get Aadhar. Aadhar is not compulsion in the sense that it is not only meant to clean up the government system but also for providing more facilities and better access to the people, that is the whole purpose. So, we have introduced Aadhar into various domains and we have been able to clean up. Talking on his key initiatives as the then Chief Secretary, he also said, ‘‘the state government of Jharkhand recognises the power and potential of new technologies. We understand how new technologies can lead to improvement in the quality of people’s lives. We believe that the developments in the field of Information and Communication Technology (ICT) can be effectively leveraged to deliver a variety of information and services to the citizens effectively and efficiently. Introduction of Aadhar based Public Distribution System (PDS) or attendance system for the government employees are some of the key initiatives which have been taken during Sharma’s tenure as the Chief Secretary in a year. Apart from this, Sharma has also served Jharkhand government in the capacity of Principal Secretary in the departments such as Human Resource Development, Panchayati Raj, Urban Development and Science & Technology. Before that he has served Ministry of Finance, Government of India between 1995 to 2000 in the capacity of Director and Joint Secretary. But laurels showered in for R S Sharma, when he delivered brilliantly as the Director General and Mission Director of the Unique Identification Authority of India (UIDAI) between August 2009 and March 2013. He played instrumental role in developing Aadhar concept with the former UIDAI chairman Nandan Nilekani. It is said that the duo of Nandan Nilekani, who was the IT visionary and R S Sharma, the man with the vast experience of bureaucratic system in the country, was instrumental in making Aadhar a reality. The objectives of Aadhaar are to create an identity platform in the country which is inclusive, improves governance and service delivery and enables people access to formal systems of service delivery,’ said R S Sharma in an interview with eGov in Jharkhand. ‘In India, there are a large number of people who do not have any formal proof of their identity. This results in denial of a number of services to them. They cannot open a bank-account, they cannot get reservation in a train and they cannot get any mobile connection as some identity documents are necessary to avail these services. In other words, non-possession of any id document denies them the access to many services. 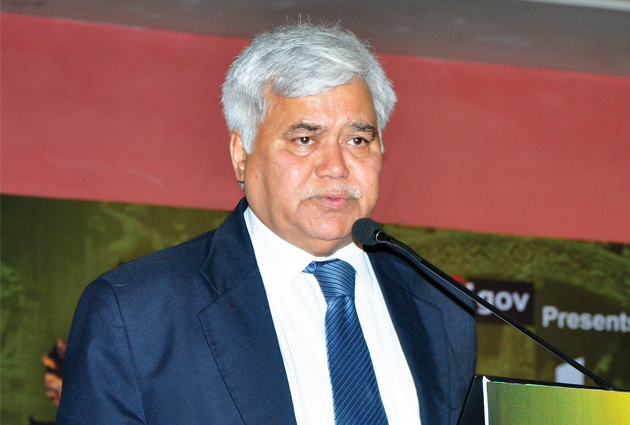 Aadhaar fills this gap as it is mandated to provide unique identity to all the residents of the country,’ opined R S Sharma in the interview with eGov. An alumnus of Indian Institute of Technology (IIT), Kanpur and University of California, Sharma has won various awards in the field of e-Governance and was also nominated for Prime Minister’s Awards for Excellence in Public Administration. R S Sharma was born on 1st October, 1955 in a small village in Agra District of Uttar Pradesh. After his early education in Firozabad, he graduated from University of Allahabad in 1974. From the post of Chief Secretary of a state to the post of Secretary, DeitY…Journey continues for Ram Sewak Sharma.